Sections A & B are separated by a footpath with Section B being the furthest away from the car park. There are now no burial plots available in this section. 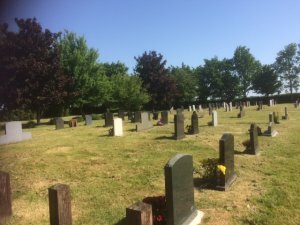 Section A , which is situated nearest the car park, has space for 128 burial plots. This is the section currently in use. Burial Rights are available on a consecutive number basis. Only single depth graves are permitted however up to eight sets of ashes can be interred in a grave after a coffin burial. Residents may purchase adjacent plots side by side and double memorials are allowed. For couples, it is advisable for the burial rights to be issued in joint names so that ownership passes directly to the surviving partner. Burial Rights are for a period of seventy five years and are effectively a form of lease. The land remains the property of Little Paxton Parish Council at all times. A memorial may be erected nine months after the interment. Permission is required for memorials including added inscriptions. As a lawn cemetery, all graves have flat grass surfaces and only headstone type memorials are permitted which are in accordance with cemetery regulations.